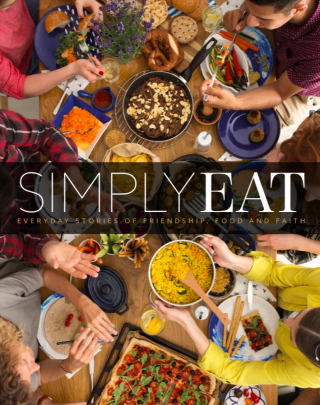 In this sample chapter from Simply Eat, Andrew Smith of The Feast Project tells how eating together helps youth from different religious communities talk about faith, build friendships and change lives – and he shares guidelines we all can follow to do the same! As someone who has always enjoyed a good meal with friends and family, the idea of a feast was an obvious inspiration when we were thinking of what to call our charity. The Feast is a Christian charity committed to helping teenagers from different religious backgrounds make friends, talk about faith and be peacemakers, changing the world around them. 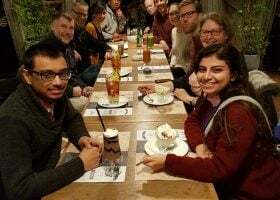 Eating is a big part of our events, which might be pizza whilst watching a film, a barbecue by the canal or a shared meal at an iftar as we end the fast during Ramadan with our Muslim friends. Apart from having fun and eating, we help the young people learn how to talk about their faith openly and honestly to someone of a different religion. This also means being willing to listen to what the other person says and, in doing this, finding the similarities and differences in what we think and believe. In 1 Peter 3:15, we read that we should always be prepared to give a reason for the hope we have within us and that we should do this with gentleness and respect. This attitude of being ready to speak but being respectful and gentle is at the heart of how we help the young people share their faith. Many people (of all ages) feel anxious about sharing their faith, concerned that they don’t know enough or will cause offence. At The Feast, our way of working is to help the young people articulate their beliefs and understanding as far as they know them. We equip them to share their own faith rather than to try to copy a talk they heard or a clever argument they read about. All this is done in the context of making genuine friends, and there is no better way of doing that than when sharing food. One of the first questions we get the young people to answer is, ‘What is the best thing about your faith?’ This sets a positive tone for the discussions and helps them share their thoughts and perspectives. We are very clear that there are no right or wrong answers, that it’s simply about helping them share their beliefs. This respects the fact that everybody is at a different stage in their faith journey and that we all come from different cultures or faith traditions, and we want to help them share their faith authentically using language that they are comfortable with. At every event we use our ‘Guidelines for Dialogue’ to set a framework for the discussions. This isn’t done to limit or censor their comments, but to provide a safe space where they can share their faith honestly and with integrity. In Matthew 9:10–11, we read that Jesus sat and ate with tax collectors and sinners, people the religious leaders thought were undesirable. We don’t know what Jesus said to those He was eating with, but we do know that they chose to come to eat with Him. People of different faiths are not to be thought of as undesirable or ‘sinners’ – they are no more sinners than the rest of us. The challenge of verse 10 is to consider whether we would be willing to sit and eat with those that other religious leaders think we should avoid today. Sadly, I do hear church leaders warning against being too friendly with people of different faiths, or advising we only meet with them if it’s specifically for evangelism. Yet here was Jesus just sitting and eating! But He clearly didn’t hide who He was. As He said in response to the Pharisees in verse 12, He came not for the well but for the sick; His compassion was for those He was eating with, but it was expressed over the mutual sharing of a meal. Many of my Muslim friends would love me to convert to Islam and they know that I would love for them to follow Jesus as their saviour. But we share these ideas and beliefs through our friendship, over food and while being committed to a loving, genuine relationship that is not dependent on conversion. This is the attitude we want to foster in the young people who come to The Feast – for them to be able to sit and eat together in a mutual, honest sharing that recognises the depth and passion of the faith we have. It’s risky, fun, chaotic and unpredictable – in many ways like a very good feast. Check back next week for another tasty sample from Simply Eat! Click here to learn more about The Feast Project. Have we forgotten that food and faith belong together?